During the summit, “I provided examples based on our data on the financing of different Islamic State (IS, formerly ISIS/ISIL) units by private individuals. This money, as we have established, comes from 40 countries and, there are some of the G20 members among them,” Putin told the journalists. “The motorcade of refueling vehicles stretched for dozens of kilometers, so that from a height of 4,000 to 5,000 meters they stretch beyond the horizon," Putin added, comparing the convoy to gas and oil pipeline systems. It’s not the right time to try and figure out which country is more and which is less effective in the battle with Islamic State, as now a united international effort is needed against the terrorist group, Putin said. Putin reiterated Russia’s readiness to support armed opposition in Syria in its efforts to fight Islamic State. "Some armed opposition groups consider it possible to begin active operations against IS with Russia's support. And we are ready to provide such support from the air. If it happens it could become a good basis for the subsequent work on a political settlement,” he said. “We really need support from the US, European nations, Saudi Arabia, Turkey, Iran,” the president added. Putin pointed out the change in Washington’s stance on cooperation with Moscow in the fight against the terrorists. "We need to organize work specifically concentrated on the prevention of terrorist attacks and tackling terrorism on a global scale. We offered to cooperate [with the US] in anti-IS efforts. Unfortunately, our American partners refused. 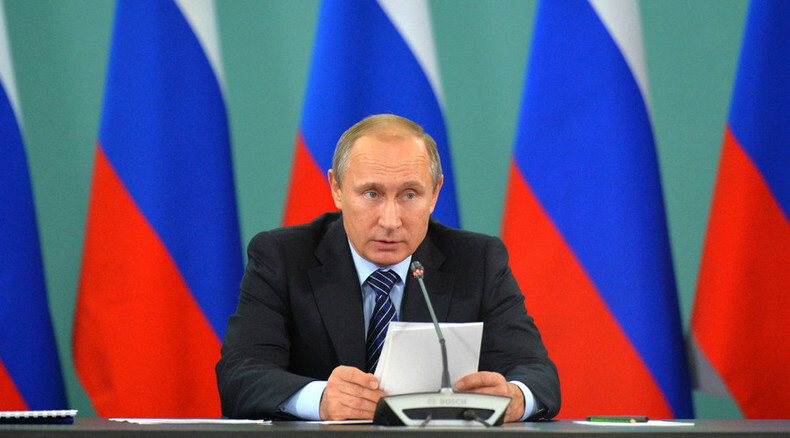 They just sent a written note and it says: ‘we reject your offer’,” Putin said. “But life is always evolving and at a very fast pace, often teaching us lessons. And I think that now the realization that an effective fight [against terror] can only be staged together is coming to everybody,” the Russian leader said. According to Putin, first of all it should be decided which groups in Syria can be considered terrorist organizations and which can be attributed to an armed, but still legitimate part of the Syrian opposition. Putin also disagreed with Western criticism of Russia’s actions in Syria, where the country has been carrying out a large-scale air campaign against Islamic State and other terror groups since September 30. “It’s really difficult to criticize us,” he said, adding that Russia has repeatedly asked its foreign partners to provide data on terrorist targets in Syria. “They’re afraid to inform us on the territories which we shouldn’t strike, fearing that it is precisely where we’ll strike; that we are going to cheat everybody,” the president said. “Apparently, their opinion of us is based on their own concept of human decency,” he added. Putin told the media that Russia has already established contact with the Syrian opposition, which has asked Moscow not carry out airstrikes in the territories it controls. It’s too early to make conclusions about the reasons for the crash of the Russian A321 jet over Egypt’s Sinai Peninsula in late October, as all possible reasons are still being considered by the investigators, Putin said. “We know about all the possible scenarios, all of the scenarios are being considered. The final conclusion can only be made after the implementation and completion of the inspection,” he stressed. "If there was an explosion, the traces of explosives would have remained on the liner’s cover and on the belongings of the passengers. It’s inevitable. And we have enough equipment and skilled, world class experts, capable of finding those traces. Only then would it be possible to speak about the reasons for this tragedy," the president added. With 224 people dying in the crash, Putin said that "it's a huge emotional pain for all of us; for all Russian people, no matter what the cause of the crash was."